First thing’s first; I like Jamie Oliver. I have always loved his use of simple ingredients and natural flavours and how he makes cooking look so easy in his videos. I am also aware of the criticism of his use of bottled sauces and store-bought ready-made ingredients in his recipes. However, my family and guests have always been more than satisfied when I’ve cooked his food. I also appreciate his campaign of healthy eating and sugar reduction from children’s diets. This summer, I was in the UK for a little over a month, giving me ample opportunity to sample the food and visit new places. 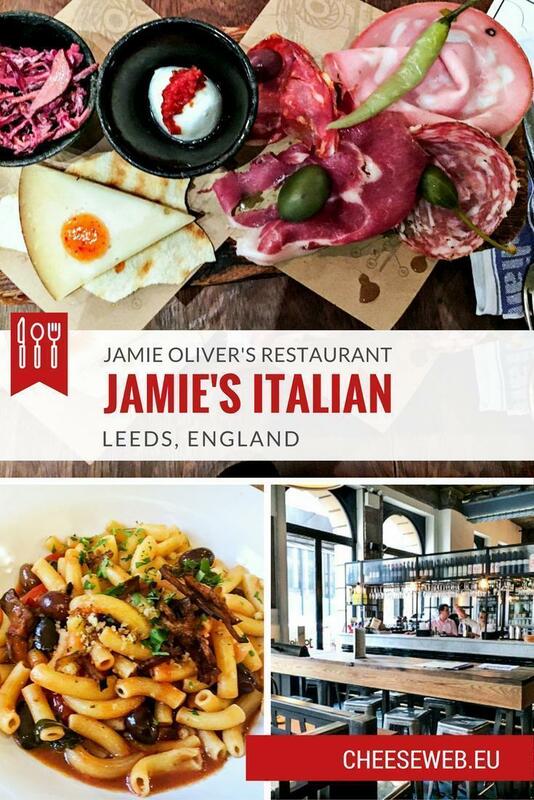 So, when in Leeds, I came across Jamie Oliver’s Italian restaurant chain, I was eager to give it a try. It helped that a promotion was happening in August, where kids could eat for free at the restaurant. I went twice; once for lunch with my three-year-old (yes, he got a free meal) and once with my other half for dinner. For my first visit, I walked into Jamie’s Italian with my toddler, with a reservation for lunch. The place was full, even though it was a weekday. I was immediately ushered to the designated table, and my toddler was given playthings, more than just crayons and paper to draw, like most restaurants. I asked for the house white wine for myself and some fresh orange juice for my son. I especially liked how the wines were explained in the menu. My white wine definitely had a cherry aftertaste as detailed on the menu. The wine menu at Jamie’s Italian, in Leeds, England. 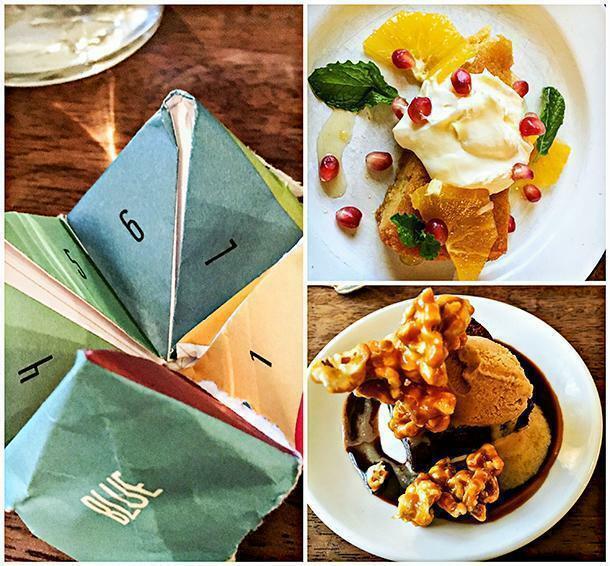 The children’s menu offered an excellent selection of healthy, child-friendly dishes. I chose chicken lollipops for my son, made with fresh organic chicken, with baked potatoes. It came with a nice salad in a shaker. I ordered a penne arrabbiata with a fiery tomato sauce with basil, which came with olives. The pasta was underdone. The sauce was good, but the pasta and the sauce were not speaking to each other. Similarly, the chicken lollipops, which were supposed to be lemon flavoured were also not as good as they should have been considering the menu said the chicken was organic. This dish was flat on taste but great in style. My son loved the salad coming out of the shaker and also enjoyed his origami paper finger game, which also reminded me of my childhood. Chicken lollipops with salad and penne arrabbiata at Jamie’s Italian, in Leeds. What saved this meal was definitely the dessert. The white chocolate cheesecake with clementine curd, pomegranate, and mint was an absolute delight. So was the chocolate brownie served with ice cream and caramelised popcorn. The crunchy popcorn with the cooling ice cream in summer was a marriage made in heaven. The entire restaurant experience was made special by the hostess, who took very good care of us. She was patient with my son and also took pictures for us, all very willingly. White chocolate cheesecake with clementine curd, and brownie with caramelised popcorn. The origami finger game was great! The next time, we went to Jamie’s Italian for dinner. We did not have a reservation, but we were welcomed warmly and were allotted a table soon after. No fuss. We took the dinner menu that evening; wherein we could choose a starter, main course and a dessert, for 18.95£. Add a glass of Prosecco to that for 5£ for a full meal. We thought the meal was a good deal and decided to go for it. I ordered the cured meat plank with fennel salami, pistachio mortadella, and prosciutto served with mozzarella topped with chilli jam, pickles, and purple slaw. It was good; the prosciutto had a nice buttery texture, and you could actually taste the fennel in the salami. I loved the fresh mozzarella, and it went perfectly with the flavorful chilli jam. My other half ordered the Truffle Tagliatelle. The pasta was handmade and came with truffle shavings. For the mains, we ordered the artisan pizza and the prawn linguine. You could choose your pizza from the list, and I decided to stick with the basic Margherita. I had the most amazing Margherita in Naples earlier this year. According to the people there, real pizza is only Margherita pizza, and everything else is a faff. The pizza did not disappoint; the crust was crisp on the outside and soft inside. I could taste the freshness of the sauce, and the basil and mozzarella added the right amount of flavour. I immediately thought the chef is Italian, which was later confirmed by the hostess. The linguine was delicious. It was cooked as it should have been and still had bite. The prawns were fresh, and the sauce was perfect. It was delicious! We wiped our bowls clean and then ordered dessert. I, once again, went for the white chocolate cheesecake with clementine curd, which was delightful yet again. My better half wanted to try the tiramisu pavlova, which the hostess said had run out. He then ordered a molten chocolate praline pudding. Now, this one is for great fans of chocolate, which he is. The chocolate cake was warm with a nice gooey centre and was paired with ice cream. This was a meal we enjoyed thoroughly. The ingredients were good quality, cooking just right and the service was pleasant. Another important feature of any dining experience is the restaurant’s atmosphere. 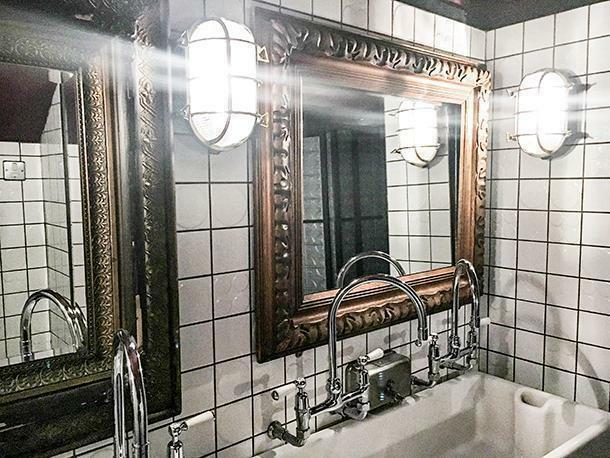 Jamie’s Italian, in Leeds, is a wonderful mix of rustic setting with a modern feel to it. The restaurant is close to the city centre and is spread over two floors with the restrooms in the basement. 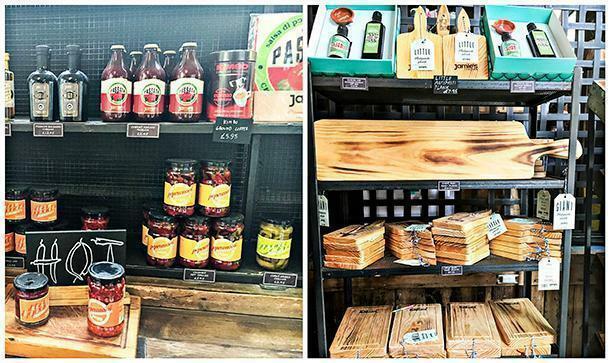 Patrons enter the restaurant to a little lobby area where Jamie’s Italian range of products is displayed. The short staircase then leads to the first floor, which houses an open kitchen and has a bar with horizontal wooden slabs adding a sense of luxury. The bar then gives way to the dining area, which has a rustic quality with its wooden tables, meat planks displayed on brick walls, and a mosaic floor. I loved the interiors of Jamie’s Italian! 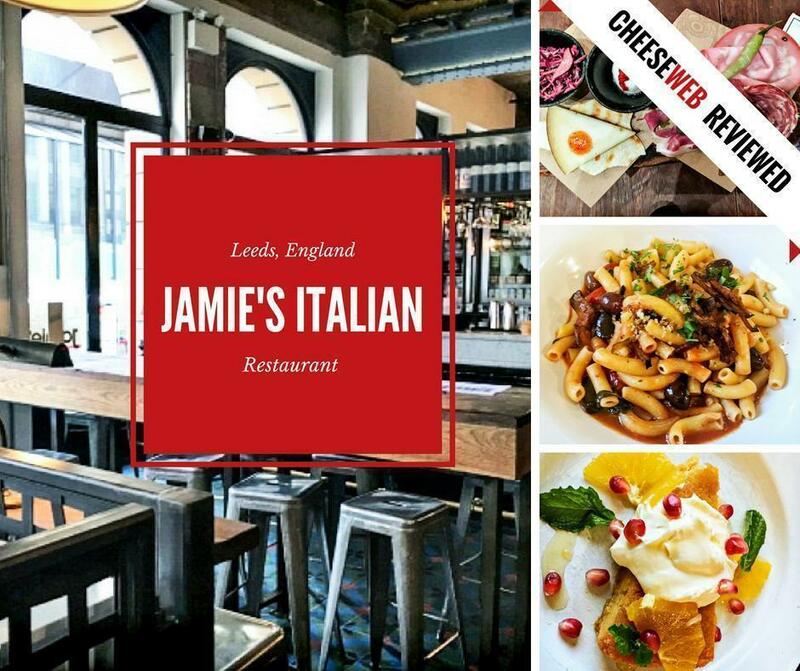 Overall, the ambience of Jamie’s Italian is good, the service kind, and the entire dining experience is special because you know you are eating at a restaurant where a celebrity chef created the recipes. However, the cooking has to be consistently good, so each meal is an amazing experience. Ultimately, it all boils down to one question: was it value for money? I would say, yes, it is!